Only a Main account holder can create, edit and disable user accounts. When creating a new account we recommend that you inform the new account holder NOT to share their account with others or to change their registered email address to another person's email address. Step 2. Navigate to the School Settings > Sports Users menu option. Step 3. 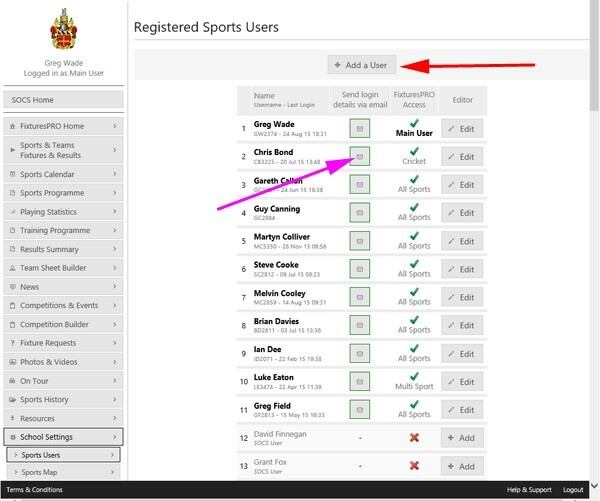 Click the + Add a User button located at the top of the Registered Sports Users web page (indicated by the red arrow in the example screen shot below). 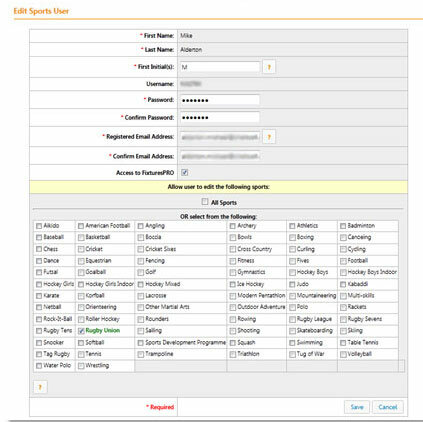 Main Account Holders will see the screen opposite when creating or editing a Sports User account. Once changes have been made, or a new account has been created, ensure to send the sports user their account details via email. To do this, click the appropriate “Send Login Details via email” button, located on the Registered Sports Users web page adjacent to the user’s name. Once the email has been sent the colour of the button's outline turns from red to green. The Send Login Details via email buttons are indicated by the purple arrow in the screen shot above. Account Holders are able to change their password and registered email address. The registered email address is important and required for username and password retrieval purposes if forgotten. The “First Initial(s)” are only used for any match reports written by the sports user. First initials are automatically attached to the bottom of match reports. User accounts can only be disabled by a main account holder. Navigate to the Edit Sports User screen, as described above. To disable an account remove the tick in the Access to SOCS sport check box.